Somewhere between the title of the book and the fact that it is a fantasy setting, I became convinced that The Edge of the World was set in a world that is literally flat, with a ship that literally sails off the edge. This mistaken perception is entirely my fault, and it quickly became obvious that I was wrong when I began reading the book. Just thought I would warn you in case you laboured under the same generous delusion as I did.Instead, The Edge of the World is one of the lazier stories I've read this year. I mean, Kevin J. Anderson has himself a world with frelling sea serpents. That's badass, man! And what does he choose to do with this storytelling boon? He squanders it on a pathetic, poorly-conceived religious war that stretches on for fifteen years.And not. A Single Thing. Happens.Your "obvious hyperbole" alarm should be ringing by now, but I am not exaggerating too much. The Edge of the World is a long but quick read because almost nothing of any interest or importance happens in the story. Characters live and grow older. Some of them die. Some fall in love, give birth, raise children. But none of it really seems to matter.The problem lies with the central conflict, which is so contrived that I can't take it seriously. The two major religions of the known world happen to be distributed by continent, so that the Tierrans worship Aiden and the Urabans worship Urec. An accidental fire burns down their mutually holy city, Ishalem, sparking a war between the two continents/religions. Well, not exactly a war. More like a state of mutual aggression. Both sides commit atrocities, build navies, and do some raiding of fishing villages. But neither side's leader seems to have any desire to prosecute the war to any extent. Anderson does his best to make both leaders sympathetic, multi-dimensional characters. Unlike their followers, who do their best to imitate mindless zealots and stereotype the other side as inhuman, heretical monsters, these leaders are rational men who know that both Tierra and Uraba benefit more from peace than war. It just seems, thanks to the actions of various subordinates and serendipity itself, like they have no choice in the matter.Anderson seems to trying to comment on how easily religion can be twisted for political purposes, as well as emphasize the horrors of blind hatred at the hands of the masses. There are some truly terrifying moments when the Aidenists or the Urecari commit one atrocity or another against their heinous enemies. Ultimately, however, I don't care about either side in this religious war, because Anderson does not spend enough time making his religions convincing. Like his people, the religions themselves are paper-thin caricatures of the real thing, designed only to further the plot. This undermines their ability to make any grand point about the horrors of religious war.It is tempting to blame this on the multitude of characters and viewpoints Anderson makes available to us. There are so many characters and so many subplots, and we jump from one to another so quickly that it is difficult to become invested in any one plot. But Anderson does the same thing in his Saga of Seven Suns series, and it's not a deal-breaker there. No, the real problems with his religious war are timing and realism.Are we supposed to believe that the Aidenists and Urecari have lived on adjacent continents for centuries yet are ignorant of each other's societies? That's absurd. Either they would have already gone to war, or the degree of interaction between the two continents would be far greater than it is at the beginning of this book. Instead, the Tierrans and Urabans know almost nothing about each other, despite their proximity and the fact that we know the former, at least, love to trade at Uraban ports. That's not how societies work, and Anderson never offers any explanations for how such an unlikely stasis could persist.Yet persist it does, even against Anderson's attempts at exploration. For a book called The Edge of the World, most of the action takes place on the continents of Tierra and Uraba, with precious little exploration being done. The first time the King of Tierra sends a ship out to explore the vast unknown, it gets unceremoniously wrecked by a Leviathan (which is awesome). The second time he does this, the ship doesn't even get out of port. The only real discovery that happens in this book is the result of a journey across a desert to this world's equivalent of the Far East and the Mongol Empire.With that second failure at an exploratory expedition on Tierra's part, my enjoyment of this book really soured. Criston Vora, the only survivor of the first expedition, shows up after a decade of self-imposed hermitage just so he can go on the second voyage. And what happens? He watches the arkship burn. Harsh. I felt as if Anderson had crossed the line between confronting his characters with adversity and smacking them against a brick wall. Seriously, what is the point of making me read about not one but two expeditions that go nowhere? The loss of the first ship was fine, but with the second ship's loss, I started to wonder if Anderson really wanted to explore the rest of his world. He seems content enough, at least for the majority of the book, to spend time not waging his silly little war.So as a book of exciting exploration and adventures, The Edge of the World is a huge disappointment. And as a book of an intense religious war filled with moral ambiguity, insane priests who think their job is to go about burning churches, and depressed sailors, The Edge of the World still manages to be bland and boring. I found the political machinations just as predictable as I found the lack of exploration surprising.I have only mentioned one character, Criston, in this entire review. That's not to say that Criston is the only important or noteworthy character; many of the main characters are struggling to do the best they can with the plot Anderson hands to them. Criston merely served to demonstrate a point for me; otherwise, I would not have mentioned him at all. For if there is one thing I want you to walk away with from this review, it is an understanding that this book is so mired in generalities that it almost feels like it was pulled from a random story generator.Kevin J. Anderson has never impressed me with his characterization before, and he has not changed that opinion here. I don't mean to indict him just for The Edge of the World, because even though it is an unsatisfying read, I can still tell it is a sincere effort. So yeah, you do get points for trying, but that's not nearly enough.Some books are better left unexplored, not because they are so bad they're good or so bad they're bad but because they're so bland they aren't worth your time. Absolutely terrible. I'm on page 150 and ready to quit.I was lured in by the beautiful cover and the promise of high sea adventure and discovery and I'm sorely frustrated and tired of the religious and political dribble that Anderson has presented.I disliked the multiple storylines and the constant flipping back and forth between them. The icing on the cake was the Romanesque manner of brutally and sadistically killing each other... If I wanted to read that I would read true accounts of the holocaust!In all I don't see any further reason to continue to struggle through this book since it's not delivering what I wanted.This may be what some people are looking for in a book, but it's definitely not for me. Let me preface this review by saying I am a fan of Kevin's work on the Dune series. This book is an absolute waste of time. I almost never start a book and not finish it but was 3/4 of the way through this piece, went to the book store, bought half a dozen new titles and immediately dropped this in favor of the new Jim Butcher / Dresden title.The whole plot line of the book is an obvious re-write of Christian vs. Muslim theology with the Jews (in this case) as the semi neutral map makers (and holders of unknown wealth - cliché' much? )...The lack of creativity is astounding, the action non-existent, no suspense, fragmented multiple story lines. In a real time parallel - the same unfortunate tendency for the Aidenist / Christians turning the other cheek while hoards of obvious Muslim clones commit atrocities and terrorist attacks - just adds to the frustration of seeing the same on everyday news headlines for the last 10 years. If I want to be depressed I can just watch the nightly news; I read fantasy for a different flavor. I was fortunate enought to get my hands on an Advance Reading Copy of this book!Whether you are already familiar with, and a fan of Kevin J. Anderson’s other works such as his critically acclaimed Saga of the Seven Suns series, or his collaborative forays into the legendary Dune Universe with Brian Herbert (the son of Frank Herbert), or new to his creative endeavors, you will be pleasantly surprised by Mr. Anderson’s adept return into the fantasy realm. Humans have a natural inclination to explore the world around them, to push at the boundaries of the known world, to boldly go out to the edge of the map, sometimes for wealth, sometimes for power, and sometimes just to know what is out there. It’s this passion to push back the blank spaces on the maps that drove explorers like Christopher Columbus, Marco Polo, and Lewis & Clark to undertake their journeys at great personal risk, to go to The Edge of the World, and hopefully return.The Edge of the World is the first of a three book saga that offers a complex blend of exploration, clashing cultures and religions, fanaticism, ill-fated love, and of course sea monsters. As always the author’s clear and concise writing style keeps you flipping page after page, as the story unfolds a t a rapid pace, sweeping you away through the various currents of the many characters lives as we watch them try to cope with a quickly changing, turbulent environment that sets the stage for the next installment, The Map of All things (due out in the summer of 2010). Though it is a book in the Fantasy genre, it has only a small taste of magic, no wizards and warlocks, no Orcs and Goblins, no magical creatures like unicorns. It is much closer to a historical novel, but set in a different world from our own. It is largely influenced by the Crusades and the Prester John legends from our own middle ages. The story focuses on two nations, who both share the same common legends about how their lands were settled by Aiden and Urec , the two sons of Ondun who is creator of the world. Over time, each of these nations developed into two completely different cultures with two completely different religions paying homage to Aiden and Urec, but shared the city of Ishalem that sits on the isthmus separating the two kingdoms. The two nations coexist in relative peace until a fire burns the holy city to the ground. It’s this incident that sets the stage for a religious war, and a desperate search to find the fabled land if Terravitae that lays somewhere across the sea, beyond the edge of the known world.The Edge of the World will keep you on the edge of your seat. I liked this book. It was 570 some pages and knowing as you go into it that it's the first installment of a trilogy is a little daunting. There is no complete story arc in this book. Although the ending is not a 'cliff-hanger', it does leave a lot of open plot threads - I will have to read the next book. And I don't mind that prospect, despite the ambulatory pace, the book does pack a lot into its 570 pages and by the time I was finished I was thoroughly invested in all the characters.It's a solid read existing fans of Kevin J. Anderson would enjoy. I'd suggest Hidden Empire (Saga of the Seven Suns) as a better place to start if you're reading him for the first time. It's a little smaller and easier to digest. http://www.rantingdragon.com/the-edge...The Edge of the World is the first book in the Terra Incognita trilogy by Kevin J. Anderson, well known author of many popular series science fiction novels including Dune (with Brian Herbert) and Star Wars. It tells the story of two nations at war, driven by religious fervor, with a spiral of revenge and vengeance as the backdrop for a tale of adventure and daring. Both nations seek to make discoveries that would shake the foundations of their civilizations.A familiar struggleWhile the world of Terra Incognita is itself an original construct, and the peoples of the nation-states of Uraba and Tierra and their geography are original as well, the cultures at play in this series seem… rather derivative. The central focus of the cultures in the book is their religions and faith. They have a common religious root and creation myth, but have diverged significantly in their practices in the present day, each dedicated in turn to the teachings of a different primary prophet and religious authority. Each one acknowledges the common roots their faiths share, yet they focus instead on the differences, each supremely confident in the correct interpretations of their faith over the others. The Tierrans follow Aiden and the sign of the fishhook, while the Urabans follow Urec and the palm-frond. A third culture, the Saedrans, live among both peoples but hold to their own customs and faith; they are generally regarded with both mild respect and mild distrust for that reason.A trio of faiths and cultures from one religious root, sharing some beliefs but differing just enough from others to cause a great deal of friction; a culture living on the fringes of society, tolerated by both but a part of neither; the sharing of a holy city, sacred to all, each with their own claim to ‘rightful’ control. The similarities between the Christian, Muslim, and Jewish struggle for Jerusalem and the claims of supremacy of faith leaped out at me immediately. While there is nothing at all wrong with taking inspiration from history—Guy Gavriel Kay, my favorite author has done this to exceptional effect on more than one occasion—it does cause one to wonder if Anderson is making a political statement as well as telling a story, or if he simply took inspiration from a history that is rife with the intrigue and conflict his story needed.A sense of the ridiculousAs the war between the Urabans and Tierrans rages over the course of many years—Anderson is also a fan of time lapses, years at a time in some cases—I found the primary sense of this conflict to be one of absurdity. At no stage of this war do the forces of Urec and Aiden meet in direct conflict. Instead we get years of one-sided attacks, massacres, terrorism and general violence. Every time peace seems in the offing, some idiot acts without orders or in exactly the wrong way at exactly the wrong time to prolong the conflict. Even with a medieval level of communications technology, it starts to strain the bounds of suspension of disbelief when yet another field commander decides he doesn’t need authorization, doing something stupid that only provokes reprisal after reprisal. There’s no Deus acting in the Machina that has been revealed to us yet, but direct interference is about the only way this makes sense.Furthering this feeling that something else needs to be going on for it all to make sense is the form magic takes in this world. Both sides have a knowledge of magic that seems to function along the laws of sympathy (readers of Patrick Rothfuss are nodding their heads), and there is something legitimate functioning in this manner. At one point, a sympathetic model of an object does indeed reflect what is happening to the original object in a way that could not be coincidental, so it is working. However, it seems that not a single person in either nation in the entire history of their civilization has considered that a) this magic has offensive properties or b) acting upon the sympathetic models might also affect the objects. Nobody is blowing wind at model ships, nobody is building model houses to douse with water if their home catches fire, and nobody is creating effigies or voodoo dolls despite a massive war running for years. I think my primary criticism of the series, then, is that aspects of the story are not taken to their logical conclusions. Too many things seem to happen simply to keep the story going and not because it makes sense for them to happen, and it strains credulity just a little.Not to give you the wrong ideaIn spite of all of the above, I did actually enjoy this novel. It has interesting characters, a compelling plot, lots of action and adventure, and even a few sea serpents to liven things up. While the holy war overshadows much of the story, there are numerous smaller stories being told in front of the larger backdrop. We learn about a woman’s struggles to raise a child in a culture alien and threatening to her. We learn about an obsession with adventure and the need to see over the next horizon. We learn the trials of leadership in times of hardship and the pressures of coming into power too soon. Most importantly, there is a message of hope despite the dangers of a war that seems to never end.Why should you read this book?This is a book for the adventurer. If you want to read about exploration, ambition, and the willingness to risk everything to make a discovery that could change everything, then you will love this book. The world is well-made, the peoples and characters interesting, with enough depth to feel like you know and understand them, but not so much depth that the next time lapse leaves you angry you’ve left someone behind. Really, what it feels like is a fantasy novel written by a long-time science fiction novelist. The Edge of the World has enough worldbuilding to allow the reader to follow along with what’s happening, as well as a character-driven plot that leaves many of the driving characters feeling a little overshadowed by events larger than themselves, but intertwined together in a cohesive whole that never makes a subplot feel unnecessary or excessive.While you may shake your head a time or two at the way things just happen to work out, just tell yourself that God works in mysterious ways, and three Gods are quite probably more mysterious still. If you've read Kevin J Anderson's Saga of Seven Suns series, then you already know and understand his style of writing, but if you're new to his independent works, they can be a little off putting, at first. Anderson starts each chapter with a number, and the location the chapter is happening in. The chapters vary in length, from a few paragraphs to many, many pages, so it can get a little difficult to figure out at first, especially when you're learning new names for places and people. I would recommend buckling down, though, because what you have here is a richly detailed world, and a very intricate plot that ties events and people from across not just continents and oceans but through time as well, with the actions of one character influencing heavily the actions of another ten years after the fact, and all in a believable fashion that never feels like a deus ex machina scenario. The plot is fairly complicated, even at it's most basic outline, and well worth finding out the twists and turns yourself, but I'll try my best to describe it as briefly as possible. It's the tale of two countries split not just by geography but a religious disagreement as well. What follows is a basic outline of the disagreement, as it plays a heavy roll in everything to come. Keep in mind I've generalized names in the story to make in understandable. Basically, God sent his two eldest sons out to explore the world, leaving Eden to venture forth and discover the world he created, thus glorifying his creation. We'll call the sons James and Tim. James was given a magic compass that always pointed back to Eden, and Tim a detailed map of the world, that they might work together to accomplish this task. They then set off in their crazy Ark armada to go do what God told them to. Now, here is the disagreement. During the voyage, the Jamesists say Tim got greedy, wrecked Jame's compass, and tried to take over the armada. Timsians say that James stole Tim's map so Tim wouldn't find his way. Stuff got heated, and the two brothers split into groups, each with his loyalists, and each taking half of the armada with him. After that, things get very different, that's where the religious split happens. The next thing we "know" is that there is the wreck of a great Ark ship beached at the holy city of Ishalem, and the Jamsians say it's James', and the Timites say it is Tim's. What the novel covers is the downward spiral of relations between the two groups, and the religious war that gets sparked because of it. This book is really quite good, a lot going on but everything is interesting so you're never bored with it. I would definitely recommend this to readers of fantasy that are looking for something other than the standard dragon-fighting cliche. Another Anderson Epic with Characters all over the map. Pun intended. Too many characters like too many cooks, spoil the meal. Once Again Anderson thinks he is going to give us a great feast, but he fails to deliver and he does with his premise at the very beginning when the Christians and The Muslims face off at Jerusalem.He changes that a little. It is Ishalem, and the founders of the religion were brothers so it is Issac and Ishmael.Were are things wrong from the start? The basis of this conflict is that one religion is settled on one continent and the other on the northern continent, only meeting in the center at Jerusalem and not knowing about each other really.Anderson is putting devices in front of us that is just too easy to break. Civilizations do not grow with an iron curtain between them. Even when we had the Iron Curtain in our own reality, we still knew what was going on behind it.I read a review of the movie Taps, about the kids taking over the military academy years ago. It stuck with me when the reviewer asked, why did the media not jump all over themselves to interview the boys. Anderson's work, here and in the poorly conceptualized Seven Sons, fails to meet that litmus test. If there is something so obvious that everyone would question it, then that hole in the dyke needed to be filled, or else the entire work was flooded.The two different countries should have known about each other more. They can't have a war for 13 years with just a few terror raids. They can't have a large city state society and think that 1000 new enlistees in the army/navy is going to be enough to wage the war. They can't wage a war when the budget of building a ship, like the cost of one of our aircraft carriers for a year, is going to be hurtful.Too many things against this fantasy tale to think that the leaders have the brains to run a country. They can barely tie their shoes they are really that narrow minded stupid about things.Then the last big thing, that there is another continent that they all forgot where they had come from. Yeah, that happens. People are really that dumb, and that the people who first sailed ships had no writing so things could not be written down, except of course their religions. When one builds a world, one needs to think of the holes. Plug them and make a real tale out of it. The Cover sold me this book. I wish it had been uglier now so I would never have picked it up. Not a reread. Very entertaining debut to the Terra Incognita series; if you are familiar with the author Seven Suns saga, you will recognize a lot of the same plot devices, character archetypes, and the same "no character" is safe from summary dispatch, heartbreak, dramatic change... The story is complex with multiple POV's and is always clearly written and very enjoyable; also the book is a page turner and it ends at various stopping points in each of the multiple threads with the next book an asap book. Announced as a trilogy (thankfully), this one should avoid the repetition of the Seven Suns after 4-5 volumes when i kind of lost interests despite loving the first 3 books.Highly recommended. I grabbed this as soon as I saw the title. Off the edge of the map. Here be monsters? I am sooo there.BONUS: This book has a rock soundtrack. I haven't checked it out yet, but perhaps you might want to enhance your reading experience. Terra Incognita: Beyond the Horizon by Roswell Six. Let me know how it goes.More characters than a Greg Keyes novel, and less than Martin's Song of Ice and Fire series - you follow about 8 - 10 characters (sometimes less because 2 or 3 characters meet up for a while). Each chapter moves you from character to character. Keyes is so great with this style, because all the characters are in the same amount of danger at the same time, so you just keep plowing through. Anderson doesn't always make that happen, so there were a couple of times I skipped chapters to follow someone through danger, and then went back to pick up the other characters. But I liked all the stories, don't get me wrong.Above all this is about a religious war. I expected to care equally about both sides, and that's the way it started, but by the halfway mark, I was only cheering for one side. I'm curious if that will change as the trilogy continues.The two ship voyages in this book I'm sorry to say, are short. I hope they are just appetizers for the major voyages yet to come.Characters - good, interesting. They won't end up in my pantheon of favorites, but I cared about them.Magic - Just some minor sympathetic magic used in navigational instruments, practically zero.Creatures - several sea serpents, an ice dragon, some mammoths, and a leviathan.Action - not high action, but moves along at a steady pace.Cool places/cities - The city of Ishalem, with the giant arkship up on the hill is pretty darn cool. And the haunted island is, I hope, just a teaser for what's to come in future books.It feels like the first book of a trilogy, and that's not a bad thing. I am excited for the next book. Anderson seems to be a prolific author. I wish he'd taken more time with this one. He's got a pretty good framework and some strong characters. The plot overall is credible. I was stalled early on by the assumption that the isthmus provided an almost impassable barrier, not only between north and south but between the two seas. No one ever thought to build a canal?They have sympathetic magic, but seem to use it only to track distant ships. No one has ever found anything else to use it for?Later, I stalled mostly on the linkages between plot elements. There were several wildly implausible coincidences that I won't describe as spoilers; let's just say that they involve characters finding a place or thing that they would actually have been very, very unlikely to find in a realistic world. There's a lot of unsubtle foreshadowing, too. The sort of thing where a knife gleams and is lovingly described, so you know someone is going to get stabbed in about two pages. The new Arkship needs a new mast. A two-man saw takes all day to cut the tree down. That's perhaps plausible if they haven't yet discovered the idea of putting teeth on the blade. And yes, we have some very big trees where I live. So, it's readable but frustrating. I think Anderson could have made this a much better book than it is. I'll read the next one anyway. 3 StarsWhile I enjoyed this page turner that is geared of the adventure reader, I never really loved it. I expected more adventure on the sea than what we get here. This is truly unfortunate as the little sea going that is presented here is top notch and a blast to read. The book lost me around two thirds in when after another period of time passes, Criston no longer is the main protagonist of our story. His pov was my favorite by a long shot, and when it went missing, so did my attention. I enjoyed many of the alternative Pov's but wished that Criston would have been around for the whole thing. At least the ending shows us that he will once again be a focus.The sea going, sea monsters, adventuring, and pirating are a lot of fun to read. I only hope that we get much more of this action in the remaining novels. What? That's it? 565 pages of story, then Anderson just stops. I realize that The Edge of the World opens a series, but I also expect each volume to be a self-contained story. No, the narrative just stops. No conclusion, no cliff hanger, nothing. Yes, yes, several characters commitment themselves to future action, but that happened several times during the story.I was ready to give this book four stars because Anderson does a credible job of world building and characterization. His warring kingdom are complex enough--though thinly veiled analogs to medieval Christian and Moslem states, with the analog Jews co-existing with both. There are good guys and bad on both sides and the major characters--of whom there are many--are satisfyingly complex. The story itself was more like a history than and narrative. More telling than showing.But the ending was totally unsatisfactory. This was easily one of the hardest books I have ever had to put down while reading! Anderson masterfully creates an entire fantasy world with social, political and religious conflicts that in some ways mock or ridicule our own world's problems. Small bits of the story that may be overlooked in the beginning play important parts in later events as you watch people grow and mature in an ever growing world with diverse cultures. One of the best stories I have ever had the pleasure of reading! Kevin J Anderson is well known in SF circles for his "Saga of Seven Suns" SF series, and more visibly, for his extensions of the Dune universe written by Frank Herbert's son Brian.Here, in The Edge of the World, Kevin J Anderson tries something new--a fantasy novel. As it so happens this is the first novel of Anderson's I have read, and so I came into reading this novel unaware of first-hand knowledge of his writing styles and choices.The Edge of the World is billed as the first of the "Terra Incognita" series, and is set in a very low magic (lower than even, say, George R.R. Martin's Game of Thrones world) universe. The level of technology, aside from gunpowder, is pre-Renaissance, early Age of Exploration. And therein hangs the hook for his story. Two squabbling nations divided by different interpretations of a common origin myth find themselves, by bad luck and coincidence, drawn into a protracted religious-political conflict. In the meantime, both nations strive to explore the world beyond the continent that houses both Tierra and Uraba. There is a third, smaller, religious group that lives in both lands and tries to get along in the midst of the war. Although I am sure Anderson did not intend it, I got a Guy Gavriel Kay vibe from the parallels between his three factions and the Kindath, Asharites, and Jaddites.The book is divided into short chapters--over 110 in a 570 page volume. Plenty of POV characters in all three groups. Readers used to large casts and whiplash changes between POV characters will be familiar with the technique. Having weaned myself on Martin and Erikson, I didn't have a problem with the structure of the book. Too, many of the plot contrivances and coincidences seemed fine, if suitably tragic to continue to simmer and increase the conflict between the two nations. Characters show up and often die quickly, again, much like Martin and Erikson. However, I felt a couple of the twists and turns in the tale seemed like needless cruelty and not important to the overall plot. I didn't see their point and it was somewhat offputting. Also, while Anderson mostly does a good job to show that both sides in the religious-political conflict are capable of atrocity and evil, the finger does seem a bit on the scales to one side, at least to my perception.With those concerns aside, however, the Age of Exploration is an interesting time period in Earth's history, and Anderson captures it well in his fantasy universe. He's an accomplished writer, that comes across very well.And aside from some of the plot concerns, I was more than well satisfied with character development, growth and change. Anderson paints on a pretty big blank map (a metaphor used in the book) and I do want to see how the map fills in, especially given the discoveries made by characters from both nations in the novel.I am intrigued enough by the novel's strengths to want to continue to read the series, and perhaps eventually try his Saga of Seven Suns novels, too. After writing nearly a dozen novels in the "Dune" universe (with Brian Herbert) and the outstanding seven-volume space epic The Saga of the Seven Suns, Anderson has turned to fantasy in his latest series. This book is the first part in an expected trilogy call Terra Incognita. The world he creates is two continents connected by an isthmus. There is just a hint of magic, sea creatures are large and scary but have no super powers, and much of the mystique is in the legends. The technology and knowledge level is comparable to 12th or 13th century Earth. The northern continent is called Tierra, and is populated by a culture that is Scandinavian-like. The southern continent is called Uraba and is very western Asian/Mid-Eastern. The main story line revolves around a holy war that is ignited by accident when a fire breaks out in the Uraban section of Ishalem, a divided city on the isthmus much like Jerusalem. It occurs, ironically, when the two leaders are meeting there to celebrate a treaty that will assure peace and prosperity for the future. Tempers flare as both sides think the other started the fire and in the end the city is totally destroyed.The secondary storyline is about discovery; the Tierrans send a ship to the unknown waters west which leads to disaster, and the Urabans send an expedition south across the vast desert to find another civilization and possibly a way to defeat the Tierrans. As you would expect from Anderson, there are many characters whose stories are woven into the web of the story. I found two that were very interesting. Adrea, a young Tierran, sees her new husband off on the ship that sails to the unknown and then is captured when the Urabans raid her village. She finds favor with the young leader of Uraba and ends up bearing him children and in the end is forced to do something terrible. The second is Prester Hannes who is send to Uraba as a religious spy, almost burns to death in the fire, is nursed back to health by the daughter of the old Uraban ruler, and escapes to cause havoc for the Urabans. His descent into darkness is very well written.Surprisingly, I was a little disappointed at the end of the book. Anderson wraps up a few of the main storylines, but too much was left for the next book making it somewhat unsatisfying. I know that in a series some things need to be left hanging, but the book also needs to be good as a stand-alone. This book reads much like Hidden Empire, the opening volume of Seven Suns, but it is not as exciting or compelling as that series was, not to mention it doesn't have the awesome ending of Hidden Empire.Make no mistake, this is an excellent novel and I recommend it. I am confident the next two volumes will pull it all together and make the trilogy a satisfying read but my expectations are high when reading Kevin Anderson and this one misses just a little. A book that promises rip-roaring nautical adventure, and then resolutely stalls for time and page count.This is a simple book set in a simple world with a simple story. 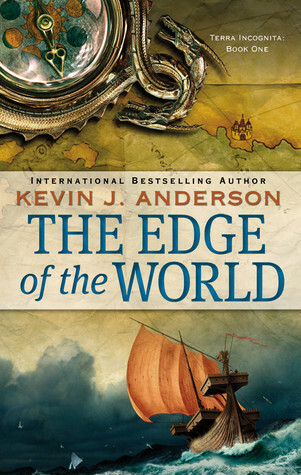 But, like a soap opera, though it is pretty much devoid of any kind of artistic merit, it entertains, and you could never accuse Anderson of running a sloppy ship – The Edge of the World sails at a fair clip.As far as epic fantasy goes, The Edge of the World is not a bad book. It is, however, guilty of false advertising. You think you are going to get a nautically based tale of exploration, as the ship Luminara sets out to rediscover the holy land, but it is soon destroyed, and though a new expedition is proposed, that ship is destroyed also, leaving us to wait until book two before things get going. Instead of the offered adventure we’re given nearly 600 pages of war preparations as the two opposing kingdoms of Tierra and Urab come to blows following a series of terrible misunderstandings.These kingdoms are the most cardboard of creations. Based very obviously on Christian Europe and the Muslim East, both follow similar religions with key, aggression-causing differences. It’s an artificial set-up, Anderson’s kingdoms exist in a vacuum, have complications regarding their scale and, most egregiously, the Arab-analogue, though possessed of a fine and cultured ruler, is populated by hateful zealots. There’s a conscious effort to balance the two sides, but inexorably, the scales of evil swing to the disfavour of the southern desert dwellers.Anderson’s gift is in keeping all this moving at such a pace that you don’t care, but if you slow down for even a moment it all becomes painfully clichéd: the wise King, the equally wise Emir-type, the avoidable war, the white woman taken into slavery to become queen of the heathens, the giant octopus, the childhood sweethearts… It’s a long list of very obvious orientalist fantasy tropes. An uncomplicated pleasure, perhaps, but life’s too short when there are so many great books out there. Many years ago, I began reading Star Wars books, beginning with Kevin J. Anderson's Jedi Academy Trilogy. Since that time, I have found a variety of science fiction and fantasy to read and write. Some have been good, some have been lackluster. However, this book seemed to remind me why I fell in love with the genre in the first place. I would gladly put this book on par with "The Lies of Locke Lamora" in captivation of the story. You seem to want to dive deeper into the characters created by Anderson in the novel, especially when Captain Aldo says at the beginning of the novel it will be a long conflict.I was a bit concerned when he introduced a plethora of characters at the beginning of the novel, wondering if this would end up being too many story lines and no resolve. However, as the novel progressed and storylines weaved and ended, I found myself satisfied, yet craving more of the series. The characterization of the novel is well-done and very true-to-life in the sense not everyone lives to see a "Happily Ever After" in the end.Though it is Science Fiction and Fantasy, I can also seem to disect this beyond the whole concept of "Heroic Journey." The two major factions, supporting the sons Urec and Aiden, can be seen as representing Islamic and Judaistic tendencies, especially in how things escalate through the book. Many of the other story lines can be dived deeper into the nature of humanity and religion. This book, surprising enough for the fantasy genre, deep literature.Kevin J. Anderson, with his tale of Luke, the Jedi Academy, and the Death Star Prototype, brought me into the genre of Science Fiction and Fantasy. And, once again, he reminds me why I find this genre such an interesting and fantastic genre to read. I can see why many people may not have loved this book. But personally I adored it. There's nothing quick, glamorous or flashy about this stoic fantasy series; however, it has endearing characters, snippets of magic and the uniqueness that you are never able to pick sides. There is a religious war and we read about both sides equally. Kevin J. Anderson does an excellent job of showing how faith and religion can become so skewed that people are blind to the obvious. The payoff is well worth the 600+ pages of reading when our characters start to clash, come together or move apart. Without a doubt my favourite character is clearly the one for whom no possible outcome to the war will be good for her. Anderson has written strong men and women in this fantasy series and I am looking forward to books 2 & 3. Plus Anderson does us all a favour by telling us it's a trilogy and holding to that decision. Bonus points that I know I won't be strung along for 6+ books with no end in site!Added early 2017: I received the CD's of music that go along with this series as a gift and OMG they are incredible!!! Roswell Six and Anderson do an amazing job of bringing the story to life. It's an amazing way to enhance this series! Additionally: I would now change my review to five stars after reading book 2 and hearing the music. There is so much here that is easy to miss or glaze over if you don't put in the time. But I still believe that this is an excellent series that is well worth the investment of reading time. i'm only 1/2 way through and have debated a number of times whether to abandon it. (finally decided i couldn't take it anymore) really not well done. way too many characters and as the plot unfolds the whole book shifts. too many plot lines and none of them develop well. not what i expected at all (skeletons coming to life and ruled by the spirit of an island?? what?? which wouldn't be bad if it was a book that involved some magic or a back story concerning the supernatural, but there is nothing!). judging by the cover and the synopsis on the back cover i believed it was a book of exploration "a sweeping tale of adventure on the high seas", but then 1/4th of the way in the ship that is sent out to explore is sunk...huh?) the chapters involve several different characters and story lines (some chapters are only 3 pages long)and there is no central purpose to them...it is over 600 pages, i made it all the way to and still couldn't find anyone or anything to really care about! and to think it's a series...eww. This book was such a disappointment. I thought this is going to be a a story of sea adventures and mysteries of the uncharted world since there are blanks on the world map but instead you get a novel that reads as a history book except nothing actually happens and all you get are a bunch of time jumps and promises that fail your expectation in the end and you realise that most of the stuff written was pointless. Sure you have a bunch of characters with their individual fates but everything is describes so superficially that they are just names in the history book. If this book is supposed to be some kind of prelude to the next one where there will be actual stuff happening than this is a waste of 650+ pages.A good history book will be read as a novel. This book is a novel that reads like a boring history book and that is a bad thing. A very good book although the author had an indifferent attitude toward the characters (there are allot of them). the attitude may turn some people off but it fired me up about the characters. (I found myself pacing) The first hundred pages are very brutal and frustrating but after that the book is much less harsh but still sad. Characters are all believable some are kind some self serving but all show a different face of humanity. Nearly all the characters develop by showing either how their face has changed or why their face is the way it is. The book never gets slow due to the many characters and they take turns being the focus of excitement. The book is very good and i would have given it five stars but it has no true point and rather tangles like a loose ball of string. I did not come away from this novel a fan or wanting to read the rest of the series. This thinly veiled allegory in which two nations, one distinctly Western-European in flavor with a Judeo-Christian like religion and and the other an Eastern desert country whose religion resembles Islam, become inextricably engaged in a bloody religious war just did not keep me interested. I went almost two weeks at one point without returning to the story and did not miss it. The novel is slow moving and ponderous, filled with characters whose story lines seem to go nowhere, and in my opinion highly derivative. I will not waste my time reading any more of the Terra Incognita series. Made it sixty pages, and just could not bring myself to read further, not even stuck on the train with nothing else to read. Too many viewpoint characters, too few of them interesting or sympathetic, too heavy-handed world-building and way too pedestrian prose. Sixty pages, and I'm not sure it couldn't have made a more compelling narrated prologue. But more importantly, sixty pages, and not a single emotional connection with this book that makes me reconsider pulling out the bookmark. This book was just ok and seemed to be bubblegum fantasy at the very least. Nothing really seemed to happen through this whole book. The last 30 pages were good but it just took 535 pages to get there. The best thing about this book is that it’s a very quick read and it baits the reader into sticking with the story. Again, the bad thing is that there is nothing really there when the reader takes the bait. I found this hard-going. And the blurb made it sound so interesting! I couldn't really find a character (among the many) that I cared about. I guess I would have liked it more if it was less about the war and more about exploring unknown places at the edge of the world... or if it had more fantasy elements in it. Kevin J. Anderson - Yes, I have a lot of books, and if this is your first visit to my amazon author page, it can be a little overwhelming. If you are new to my work, let me recommend a few titles as good places to start. I love my Dan Shamble, Zombie P.I. series, humorous horror/mysteries, which begin with DEATH WARMED OVER. My steampunk fantasy adventures, CLOCKWORK ANGELS and CLOCKWORK LIVES, written with Neil Peart, legendary drummer from Rush, are two of my very favorite novels ever. And my magnum opus, the science fiction epic The Saga of Seven Suns, begins with HIDDEN EMPIRE. After you've tried those, I hope you'll check out some of my other series.I have written spin-off novels for Star Wars, StarCraft, Titan A.E and The X-Files, and is the co-author of the Dune prequels. His original works include the Saga of Seven Suns series and the Nebula Award-nominated Assemblers of Infinity. He has also written several comic books including the Dark Horse Star Wars collection Tales of the Jedi written in collaboration with Tom Veitch, Predator titles (also for Dark Horse), and X-Files titles for Topps.I serve as a judge in the Writers of the Future contest.My wife is author Rebecca Moesta. They currently reside near Monument, Colorado.